Are You Sitting Down? 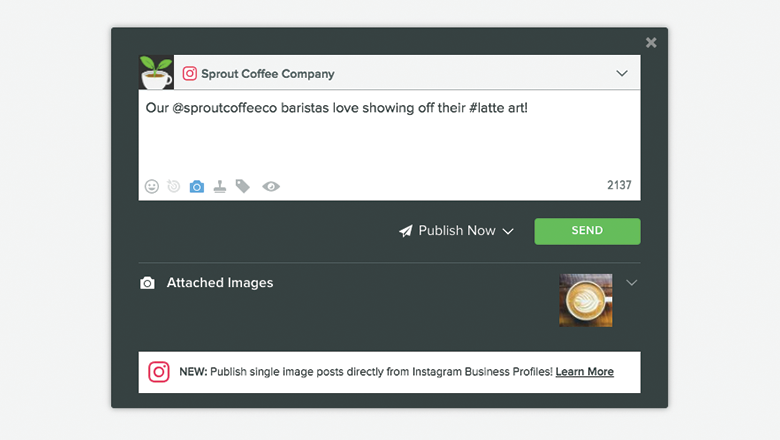 Sprout Social’s Instagram Publishing for Desktop is Here! You’ve been patiently waiting and, yes, Instagram publishing is here. Starting today, Sprout Social’s web app supports posting single image Instagram posts directly to your feed without requiring an additional mobile workflow. After connecting your Instagram page as an Instagram Business Profile, simply open Compose, add a single image with an optional caption and hit send. As a longtime Facebook Marketing Partner and member of the Instagram Partner Program for Community Management, Sprout collaborates with teams from Facebook and Instagram to relay our community’s feedback and build the best solutions for over 25,000 brands and agencies that rely on Sprout to run their social programs. Instagram has now opened up beta access to their Content Publishing API, allowing all Sprout users to post images directly to their feeds. Although the beta is currently confined to single image posting, videos and multiple images can still be shared on your feed or via Stories using Sprout’s existing Instagram Scheduling workflow. Use Instagram Publishing to prepare and organize your content in harmony by creating and planning content across all of your social networks before your posts go live. Convert your Instagram profile to an Instagram Business Profile. It’s free and takes less than two minutes. More detailed instructions for converting your profile can be found in the Facebook Help Center. IMPORTANT: Once you’ve converted to a Business Profile, you’ll need to validate the converted account in Sprout by adding the Instagram Business Profile add-on. This is also free and takes less than two minutes (and does not count toward your profile limit.) Learn more on how to do it in the Sprout Social Help Center. Note: If you’ve already completed both of these steps prior to today, you’ll still need to re-authenticate your Business Profile in Sprout to unlock the new publishing functionality. You can do so by clicking the notification, which will appear in the upper left corner of the app. In June of 2016, Instagram introduced Business Profiles to help companies better understand their followers and grow their businesses. Converting to a Business Profile on Instagram allows you to include additional profile information—like phone number, email address and a physical address—making it easier for customers to connect to your business. Adding the Instagram Business Profile add-on within Sprout has several benefits itself. Not only does it enable Instagram publishing through the Sprout web app, but it also unlocks new metrics from Sprout’s reporting suite, including impressions, reach and video views with more to follow. With more than 800 million active users and counting, Instagram marketing grows in importance by the day. Today’s update and our ongoing support for Instagram Business Profiles is proof that Sprout is committed to building and improving the tools you need to effectively execute your Instagram marketing strategies. Excited? We are too! Share your reactions in the comments below or on Twitter @SproutSocial.